This corded necklace is made using satinique cording. The length can vary from about 16 to 19 inches with a center jeweled piece that adds another 1.75 inches. It is done in a golden brown and deep purple. 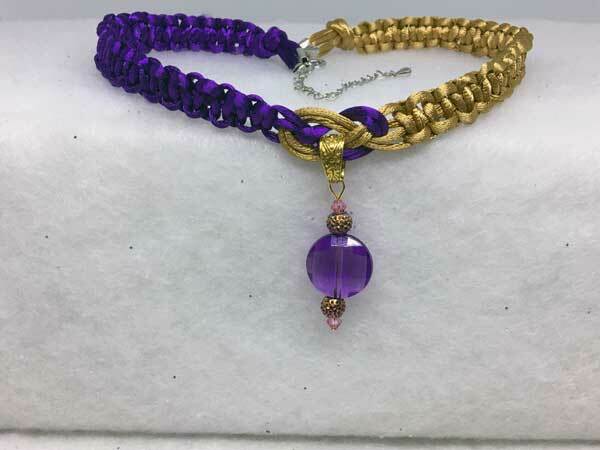 The focal bead of the jeweled piece is a deep purple fully-faceted resin coin, surrounded by purple, pink and blue sparkled rondelles and small pink bicone crystals on either side. The piece is finished with a lobster claw clasp and added chain for more versatility with the length.